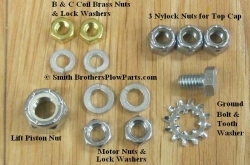 Includes the Hardware we use when we rebuild Meyer E-60 plow pumps here in our shop. 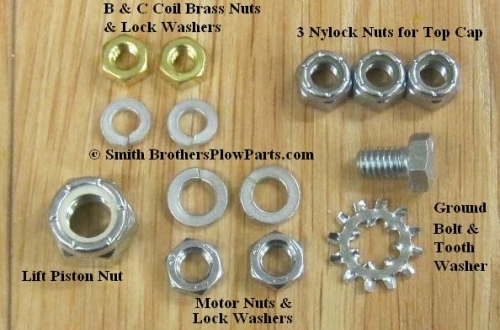 New Brass Nuts and lock washers for the B and C Coil are less likely to seize, new Ground Bolt and Tooth Washer, new Lift Piston Nut, new Nuts for both Motor Lugs with Tooth Washers, and 3 new Nylock Nuts to hold the Top Cap on. 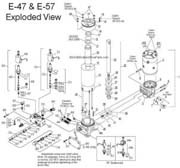 OEM Meyer Basic Seal kit for E-60 / E-60H units. 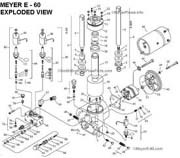 Genuine Meyer Part. 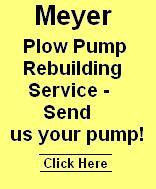 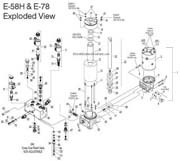 Ultimate Rebuild Kit for Meyer E-60 plow pumps fits E-60 and E-60H units.